The concert took place in February and March....and by April, the highlights had been crystallized into one of the most effectual live albums ever cut. For sheer dynamism, the showman was unbeatable and it seemed a little incongruous that Rory should suggest electric music had come to the end of an era. “Music moves in a cycle and I think Greenwich Village will be the center again…..you know back to pre-Loving Spoonful days." "It seems to cut deeper all the time and now people are going back beyond Chicago blues, which has moved out of the spotlight, and back to the country blues. I suppose Chicago period hits everyone first....and if you're interested in rock and roll, then Chicago is a easy to digest....but I'm listening to more acoustic music these days." Yet it would take a fairly vivid imagination to see Rory's feature version of Blind Boy Fuller's "Pistol Slapper Blues" as a gradual swing away from electric music. Rory admits that the acoustic part of the act may broaden, but there's no likelihood of the Stratocaster becoming redundant: this merely symbolizes Rory's complete openness to guitar styles and almost empiric approach when it comes to playing.
" I had the record of 'Pistol Slapper Blues' and tried it... then I didn't play the record for a while, so when I put it on again, I realised I was playing it differently. I decided to keep my version, which is a little more syncopated, played with a flat pick. To have copied the original version, I would probably have finger picked it." 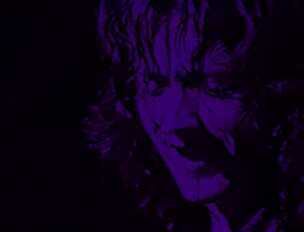 Rory Gallagher betrays no foibles of a superstar. He is surprisingly open and talks enthusiastically about the disparate influences of his youth....the country school of Guthrie, Jack Elliot, and Doc Watson, and the signs that he has missed little that Chicago of the forties and fifties had to offer either. Yet when the need arises, Rory manifests an unmistakable dogma so necessary to keep the organization in a state of equipoise. He is irrevocably against the release of singles, for example, whilst the new album further spotlights his methodical approach. Rory gave a wry smile when I commented on the speed of the release. "We used a Polydor eight track on the continent and the Pye Mobile Unit here, and because I kept up to date with things like the sleeve, Polydor kept their part of the bargain and got it out quickly. I was trying to get a good cross-section of material, but as live numbers are fairly long, we could only do one slow blues; and the mandolin track really had to be done live." "But the important things is this material is all current, and in another month or two it wouldn't have had quite the same impact as it has now." Would the repertoire be changing greatly in near future? " I think it will be.....there'll be a lot of newer, folky kind of things with a nice minor type of feel . But although you may go through a Chicago phase, then maybe an Eddie Cochran feel or bit of a country thing, you never really change your style." Both in conversation and in his playing, Rory manifests a sense of the dynamics which can be traced back to his early acceptance of acoustic and electric guitar music walking hand in hand. You only have to listen to the subtleties on the live album to sense this....the uncanny 'honking' effect he achieves from playing the harmonics on 'Messin ' with the Kid'. And then there's the question of whether he should exchange his big Martin acoustic----ideal for flatpicking-----for a smaller version which would facilitate playing finger style. Rory is clearly pleased with the way the album has turned out---far more so than with the first live Taste album for instance. "I wasn't involved with that at all---I was on it, but that's about all because I didn't know it was coming out until I read it in the music papers. "There were numbers I wanted to record on this album, like "Going to My Hometown", that I just couldn't envisage on a studio album, so the album was good for that purpose. As for Deuce, I was happy with the performance, but there's only so much you can get out of a studio, and the sound is about as hairy as you're going to get in London; you reach the stage in the end, where you realise you'll just have to record in the States, but the main thing about 'Deuce' is that it was so well balanced and so was the other album." "There won't be another live album for a while, but you've got to be playing to people all the time because they change the way you play, numbers are affected by people...even down to the drunken "yahoo' in the audience." Live appearances still hold the same fascination for him, "I always think in the old sense of the travelling musician....I mean I could never get a big hit and retire or something and my idea of a great life isn't hanging around London." "No, there's a fair kick in this group yet, and as far as Gerry and Wilgar go, some people would say that they fulfill their role and they are pre-suited musicians for the kind of music I play. But that's not what I want...that would be boring and the truth is they are that and more: they go beyond that." Aside from lead, slide and acoustic guitars, harp and mandolin, had Rory any plans of reviving brass or expanding the act in any way? "I was very interested in it during Taste because before Taste, I discovered jazz and eventually became interested in Ornette Coleman, whom I rate as one of the top three soloists in the world. So I was interested that way, but also because I went through a phase where I wanted to try another instrument; to help my guitar playing. I may decide to use it again in the studio. Rory took a thoughtful look back to the period which had seen the demise of Taste, then the interregnum and finally the emergence of the new group. "I suppose I did go back to basics after Taste because John was a jazz fan and although I went through a jazz phase, I didn't want to play blues against jazz rhythms. After that it just meant a new sense of freedom, and I just concentrated on reading and improving my techniques." "With the new band, I sensed that everyone was listening intently and prepared to like the music; but since that, it's built to a new peak independent of Taste and people are listening to the new types of things we're doing. "Sure at first, people called out for the old Taste numbers and I'd have been surprised and disappointed if they hadn't. But now people call out for "Sinner Boy" and the important thing is to make sure that people call out for the current things each time. "It seems that if you give your whole heart and soul, people will always respond as long as you are sincere about it." "You know, " he went on, "after the big blues boom influenced by Mayall, it became a crime to move onstage, but American artists have always been fond of a show and quite honestly, I think that a lot of artists over here just found that they couldn't put on a show. But the basic music we play is from the jungle and it makes it so you've got to move on stage. In the coming months, Rory will be returning to Ireland, where he hopes , once again, to be playing in Belfast, "No one is going to point a gun at a musician no matter how radical they are, but all the same I don't think Ireland will become a bandwagon thing for groups....it's too dodgy for that." And, in June, he returns to the States for the third time. "Europe has been fairly well covered and we want to concentrate on the States, where I'd like to do things slowly and just enjoy life." Finally the conversation returned to New York and the freedom that Greenwich Village offered. "The whole clubs scene in England now is just dead....and you can't have a jam session here without it hitting the papers, but you could do it in New York." "If you had the Crawdaddy and Marquee scene back to its old thing, it would be far better, and if the club scene did come back, groups would have to play for cheaper prices. Where is there for a new group to play these days?"